Kamen Rider Gaim Celebration – Day Two – The Nut Bros. The end of Kamen Rider Gaim is fast approaching – and at TokuNation.com we’ve chosen to celebrate this very popular series with a send off spanning nine total days looking at every single Rider from the show and movie! Stay tuned because at any time we can announce a contest on our twitter account (@TokuNation)! It is now day two of our celebration and we thought it would be fun to celebrate a group of Riders that, because of their Lock Seeds, have been dubbed in some circles as the Nut Bros.. They would be Kamen Rider Kurokage, Kamen Rider Gridon, and of course, Kamen Rider Knuckle. And while the “bros” part is more appropriately given to Kurokage and Gridon for their relationship at the start of the series, it also felt worthy to include Knuckle in the group as well. Please click “Read More” to see our entire article on these three popular Riders! But of course be warned – there are major SPOILERS in doing so, as we look at their history throughout the show and in toy form. So join us as we look at our Nut Bros. – Kamen Rider Kurokage, Kamen Rider Gridon, and Kamen Rider Knuckle! This weekend one of the most popular toku series of all time will come to an end – Kamen Rider Gaim is coming to an end with the airing of its final episode, “Transform! And to the Future!”, the 47th and final installment of this beloved series. It’s popularity has spawned one of the most successful merchandise toy lines (in both the Arms Change figures as well as the DX Lock Seeds and Sengoku & Genesis Drivers) in Kamen Rider history, and helped gain a slew of fans to the franchise that are either new or had stopped watching Kamen Rider thanks to the love it/hate it series of Kamen Rider W and Kamen Rider Fourze. Kamen Rider Gaim has been an incredibly popular series here at TokuNation.com, as our discussion threads of each episode have grown larger and larger each week as fans have registered to share their thoughts on each episode. And this weekend they will do it one last time (until the summer movie is released!). While our wallets cry as we continue to buy up all the Kamen Rider Gaim merchandise (who has got their S.H. Figuarts Kamen Rider Kachidoki Arms yet?!?) we figured it was only fitting to give this series a proper send off here with Nine Days of Juicy, the Kamen Rider Gaim Celebration! Over the course of the next nine days, starting on Thursday, September 25th, we will be posting an in-depth retrospective of all the Beat Riders, Armored Riders, and Energy Riders. Our celebration will end on Friday, October 3rd, right before the premiere of Kamen Rider Drive, the next installment of the Kamen Rider franchise. But what good is a celebration if the party has no party favors? As we get close to the end of the celebration, followers of the TokuNation twitter account (@TokuNation on Twitter) will have a chance to win two S.H. Figuarts of characters from Kamen Rider Gaim! If you haven’t followed us on Twitter then you’d better hurry – our give away requires you to be a follower of our twitter account and to also re-tweet the give away tweet! Watch for it! We hope you’ve enjoyed Kamen Rider Gaim as much as we have. So let’s give it one heck of a send-off by celebrating everything about the show – the good, the bad, and the simply confusing stuff! HENSHIN!!!!! For those of you who aren’t attending this year’s San Diego Comic Con or don’t plan to save up your dollars to hit the after-market on some of the must-have exclusives (SH Figuarts Armored Black Ranger, Bandai’s Legacy Items, Legacy Lord Zedd), great news – our sponsor BigBadToyStore.com has some new items in stock and a ton of items on pre-order! Check out some of the great items available listed below! ITEMS ON PRE-ORDER! ORDER NOW TO GUARANTEE YOURSELF ONE! How important is it to get these items pre-ordered now and save yourself the hassle later? You wouldn’t be paying upwards of $75 for SH Figuarts Kamen Rider Gaim on eBay if you had simply pre-ordered it from BigBadToyStore.com. You won’t find better customer service around and please take advantage of their Pile of Loot system so you can purchase multiple items and save yourself on shipping costs! Check them out and tell them TokuNation recommended you! Click “Read More” to read their latest newsletter and see all the new items recently listed for Marvel, DC, NECA, Transformers, and more! Magazine scan time has come around once again for Kamen Riders this month! 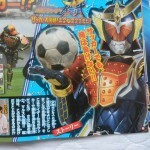 And it looks like this months’ main focus is the Kamen Rider Gaim movie, The Great Soccer Match! The Golden Fruit Cup! 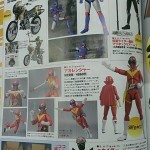 This newest set of scans from the film reveals some in action shots of new comer fighters Kamen Rider’s Mars & Kamuro. Also shown is Gaim’s Dark Jinba Arms in action, a selection of some of the new Arms Changes Gaim will be trying out in the film, and a team-up or two you may not ever have expected to see. These scans show us the return of Takatora with his original Sengoku Driver, utilizing the Original Kamen Rider Zangetsu suit! He goes toe to toe in these scans with his brother Micchy still posing as Shin Zangetsu. Upcoming episode rumors say the outcome of this battle will see the elder Kureshima brother on top. We’ll see how the battle plays out in a few short weeks! Until then click “Discuss on the TokuNation forums” to head to our Gaim Rumors/Speculations thread to discuss these spoiler heavy implications! Our site sponsor BigBadToyStore.com have sent out their latest newsletter and let us know of some new tokusatsu items that are now available for pre-order, as well as a new arrival for you Ressha Sentai ToQGer fans! We’ve included images of all the items listed below. Check it out! NEW ARRIVALS – SHIPPING NOW! Don’t miss your chance to guarantee yourself some of these exclusive items from Japan! Without a personal friend to help you out, the after-market price on some of these will become very high. Save yourself the headache and order from BigBadToyStore.com today! Please click “Read More” to check out their full newsletter – especially if you’re a fan of the anime series Attack on Titan or if you’re a G.I. Joe fan! Yet another rider from Kamen Rider Gaim is slated for release in the S.H. Figuarts line this year. This time it’s Kamen/Armored Rider Kurokage! This release of the figure appears to be of the standard Kurokage rather the the mass produced Kurokage Trooper variant. Notice the still “prototype yellow” Sengoku Driver belt he’s wearing, and the faceplate on his belt. Chances are the Trooper version will eventually see release as well though. But for now I think we can all settle for the original Kurokage, Hase! S.H. Figuarts Kamen Rider Kurokage will be released as a Tamashii Web Exclusive in October for 4104 yen. For one reason or another the Web Shop has only posted 2 official images to Kurokages’ page, 2 of which are rather boring static poses. We’ve included 3 other images that were previously leaked showing Kurokage with his partner in crime and fellow nut bro, S.H. Figuarts Kamen Rider Gridon! Tamashii Nations Summer Collection 2014 is currently ongoing. And of course with a new toy show that means new toys! And Bandai Tamashii Nations has decided to pull out all the stops with a star-studded display of their lines past, present and future! But of course what we’re interested in is the future. Take a look at their displays featuring all of these upcoming products! Kamen Rider Gaim Summer Movie Scans Online! New details and scans the Kamen Rider Gaim summer movie have surfaced online! A new leader for the Kurokage Troopers is revealed, using a Genesis Driver with the Pinecone Energy Seed (E.L.S. 05). 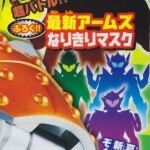 Three other Rider forms are seen in shadow, suggesting new Movie Exclusive Gaim Riders! In addition we also get brief shadow glimpses of Gaim’s Ultimate form, “Kiwami Arms!” Could this movie show us how Kouta’s final upgrade really works! The Gaim Summer Movie premieres in theaters late July! Stay tuned to TokuNation until then as we keep you up to date on all details!